Featuring the Superior Panax Ginseng plant, which was considered an herb of such great value in the ancient world that it was only available to people of great power and privilege. Ginseng is still highly prized and treasured in Asia as a key source of health and well-being. Organo Gold's Gourmet Café Supreme combines the power of Ginseng and 100% Certified authentic Organic Ganoderma, for a smooth latte blend perfect for coffee drinkers looking for a natural lift to their day. 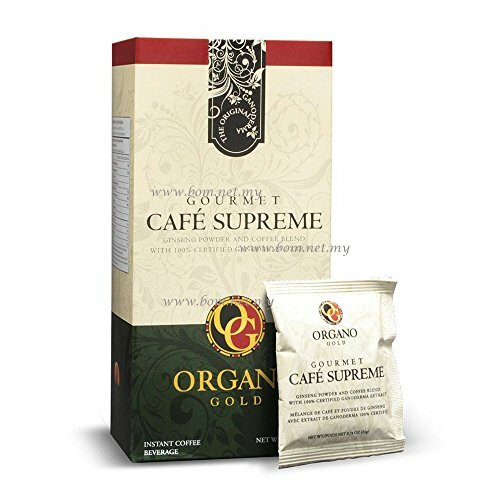 Healthy Cafe Supreme Coffee has the flavor of fresh brewed coffee, packed with the goodness of the 100 Percent Certified Ganoderma Lucidum Red Mushrooms. If you have any questions about this product by Organo Gold, contact us by completing and submitting the form below. If you are looking for a specif part number, please include it with your message.